Jackie Kallen On Boxing: Canelo is Another shot in the arm for boxing! While the heavyweight division has become a boring, depressing wasteland, thank God for the lighter divisions. There is life being breathed into our sport after all. 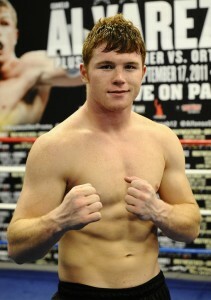 Canelo is a star in the making. He is young, likeable, and marketable. A red-headed Mexican. Not too many of them around. Thus the nickname (Canelo means “cinnamon” in Spanish.) With a young daughter and beauty queens for girlfriends, he is a fan-favorite in his native Mexico. On top of that, he can fight. Extremely well. With three older brothers in the sport, he has been battling in the ring since he was 13 years old. Fight fans love knockouts and Alvarez delivers. They may admire a slick boxer and recognize his speed and agility, but it the iron-fisted KO artists who sell tickets. Canelo fills the bills perfectly. He has an unblemished record (39-0) with three-quarters of them coming by way of knockout. Similar to Cotto’s KO stats, but without the two losses. Kirkland is right up there with his amazing record of 27 KOs out of 30 wins. His recent win over Angulo and his southpaw stance puts him right up there with the elite of the division. See what I mean? It is getting to look like the Hearns/Hagler/Leonard/Duran era. Now we have to pray that the promoters can work together amicably to put these dream matches together. That has always been a sticky situation. In my experience, the boxers themselves say “Let’s get it on!” while their respective promoters battle it out behind the scenes. To really give boxing the shot in the arm it needs–the major networks have to sit up and pay attention. They have to see the value of these potential superstar match-ups and free up some prime time for boxing. Maybe some letters from the fans to ABC, NBC, CBS and FOX will show them that there is sufficient interest. There is a Facebook page called Let’s bring boxing back to Network TV and with the UFC hitting the networks, boxing fans are getting more verbal. Canelo is just what this sport needs. He adds spice and flavor to a sport that has been hanging on by a thread. There is finally light at the end of a tunnel that has only been lit by the dream of a Mayweather/Pacquiao fight.